An environmental conference convened by His Holiness the 17th Karampa in Delhi drew attention to the environmental emergency facing Tibet and called upon China to protect the region’s fragile ecosystems. His Holiness the 17th Karmapa, Ogyen Trinley Dorjee Tuesday [12 November 2013] called on the 60 monks and nuns attending the conference to lead water conservation initiatives in their local Himalayan communities. At the close of a five-day environmental conference convened in Delhi he called on China to take responsibility for the environmental emergency on the Tibetan plateau, and for India to assume a greater role in protecting Tibet's environment as well. The 5th Khoryug Conference on Environmental Protection for Tibetan Buddhist Monasteries and Nunneries was dedicated to conservation of freshwater resources in the Himalayas, and brought together monks and nuns from 55 communities across the Himalayan region for education, problem-solving workshops and to formulate specific water conservation projects to implement in their local communities. The conference included a trip to the bank of the Yamuna River, where His Holiness the Karmapa led prayers for the restoration of the sacred, yet highly polluted Yamuna, accompanied by the Khoryug monks and nuns and local residents, as well as Dr. Manoj Misra, Director of the Yamuna Jiye Abhiyaan organization that is dedicated to restoring the river. Speaking at the close of the conference, the 17th Karmapa said: "Some people think the Tibetan cause is a political issue, but it is much more than that. The Tibetan plateau is of such great environmental importance that we call it the Third Pole and the water tower of Asia. Therefore, most importantly, Tibet is an environmental issue that affects all of Asia." The Karmapa also commented: "Just because China has had control over Tibet for the past 50 years does not mean it can do whatever it likes. China has responsibilities to protect the Tibetan environment. 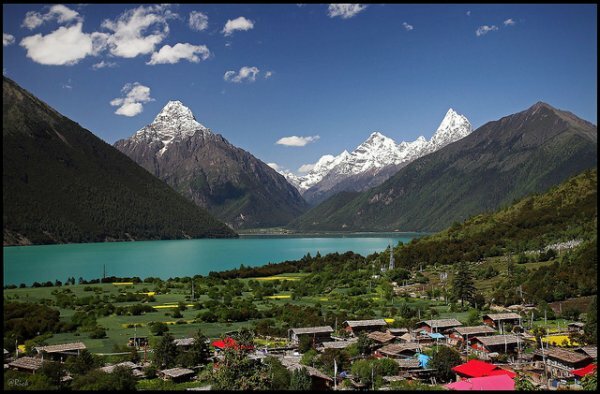 Historically, the Tibetan way of life was in harmony with the land, spiritually and environmentally, with no negative impact on Tibet's fragile ecosystems. This way of life must at all costs be preserved, because of the central importance of the Tibetan plateau as a source of most of Asia's freshwater. It is in India's best interest to take a more active role in ensuring that China meets those responsibilities. Indeed the Tibetan plateau is the world's Third Pole and thus its environmental well-being is of great concern to the entire world." "However, we cannot wait for governments to act. The environmental emergency is too urgent a crisis for us to wait for someone else to do something. Every single individual must act to protect the environment, and immediately. Each of us has a responsibility to act so we can leave a lasting home for future generations," His Holiness the Karmapa said. "As spiritual practitioners and certainly as Mahayana Buddhists, our greatest aspiration is to bring about the happiness of all beings. The conservation of our environment, which is the very ground of the existence of many billions of beings, must be our primary concern. Conservation must be the very essence of our spiritual practice." The Karmapa asked his followers to act on two areas – modifying their personal consumption of water directly, as well as indirectly. Pointing out that although much of the earth's surface is covered with water, less than 3% is freshwater, and within that tiny percentage a mere 1% is available for our usage. Along with checking our direct consumption of water, the Karmapa called on the gathering to consider also their indirect consumption, since the production of consumer goods also entails intensive consumption of water. Noting that the bulk of our water is used in agriculture, the Karmapa presented the scientific figures showing that meat consumes exponentially more water than vegetarian foodstuffs, and reiterated his longstanding appeal for vegetarianism as an environmental as well as ethical issue. Under the auspices of His Holiness the 17th Karmapa, Khoryug is a network of 55 Buddhist monasteries, nunneries and centres working together on environmental protection of the Himalayan region, with the aim of practically applying the values of compassion and interdependence towards the earth and all living beings that dwell here. In association with the World Wildlife Fund (WWF) Sacred Earth program, which provides technical expertise and support, as well as ATREE (Ashoka Trust for Research in Ecology and the Environment), CSE (Centre for Science and the Environment), and the Director of the Environment and Development Desk within the Central Tibetan Administration. The conference opened with an address by Union Minister of Rural Development Shri Jairam Ramesh, who urged the Khoryug association to "bring together institutions in these different countries in our region to launch a cohesive and unified challenge" to the environmental threat. Since an important aim of the conference was for Himalayan monks and nuns to identify freshwater threats in their communities and create specific projects to counter those threats and conserve freshwater, the conference closed with monks and nuns presenting their plans for environmental initiatives for the upcoming year.